Welcome to my very first Generation VI Rate My Team thread, dedicated to Probability-Defying Perfection, the team I used extremely extensively on PokeBattle's PBV tier for most of its closed beta lifespan, as well as in open beta up until the combination of the Ability Prankster and the move Swagger was declared banned. To introduce myself, I am Immanent God LANCE - the Great Pokémon Master, generally considered to be by far the single most accomplished Pokémon trainer to have ever walked beneath the Sun, having, throughout the past decade, achieved tremendous win-loss records on four different Pokémon NetBattle servers in Generation II, stood as the CHAMPION of Pokémon NetBattle Supremacy's highly prestigious POKéMON LEAGUE server in Generation IV, and above all, between Generation V and Generation VI, reached #1 on twenty seven different ladders across ten different servers and eight different metagames between Pokémon Online, Pokémon Showdown! and PokeBattle - not a single other trainer within Smogon University, Pokémon Online or any other Pokémon community, both in the past and in the present even comes remotely close. But as I do not wish to shift the focus of this Rate My Team thread from the team I am presenting to the topic of myself, as I admittedly, to varying degrees have done in past Rate My Team threads, I will end my introduction now - if you wish to know more details about myself, consult the introductions of my three previous Rate My Team threads for Generation V, also known as the From Burning Fire To Freezing Ice Trilogy - Flames of the Heavenly Light, The Blazing Glaciers, and especially my tenth anniversary Rate My Team thread, Mirages of the Frozen Wasteland. Since this team is no longer usable on PokeBattle due to the banishment of the Prankster + Swagger combo, which is utilized by this team's Klefki, I no longer have any use for this team, and am therefore making a Rate My Team thread dedicated to it, in order to carve upon history a symbol of the Pokémon Mastery embodied by my creation and immense success with using this team. To tell the truth, Probability-Defying Perfection was not a team that I built from scratch. This team actually originated from an OU team that was given to me by my great friend and loyal clanmate Arsenal, consisting of Conkeldurr, Aegislash, Thundurus-I, Landorus-I, Garchomp and Dragonite. As I was pretty much exclusively an Übers player in Generation VI prior to being given this team by Arsenal, this is the very first team I used seriously in XY OU. Thundurus-I was an Expert Belt-wielding *mixed attacker with additional utility thanks to Prankster Thunder Wave, Garchomp was a Focus Sash Stealth Rock lead, and the other four members of the team play roles that are virtually identical to that which they serve in Probability-Defying Perfection - Aegislash was a Spooky Plate-holding, specially-oriented mixed attacker but had Sacred Sword instead of Iron Head, Landorus-I was a Life Orb-holding and Sheer Force-abusing special attacker, except it had Focus Blast and Psychic instead of Hidden Power [Ice] and Stealth Rock, Dragonite abused its devastating Choice Band set except with Superpower instead of Earthquake, and Conkeldurr in Arsenal's team was completely identical to itself in Probability-Defying Perfection. During my time using Arsenal's team in OU, I did make one change to it - witnessing that the team contained no Mega Evolution, I decided to replace Garchomp's Focus Sash with a Garchompite, while also giving it a specially-oriented mixed set with Draco Meteor, Fire Blast and Earthquake in place of its old physically-offensive set (which, funnily enough, notably possessed an Earthquake that was weaker than my Mega Garchomp's, despite the fact that the old Garchomp had 252 EVs in Attack while my Mega Garchomp had only 4 Attack EVs), in order to heighten its wall-breaking power to the maximum level. However, I noticed that Arsenal's team had two major flaws - the first being its incredible weakness to Mamoswine, and the second being its lack of countermeasures to entry hazards, something I have never liked for any team, much less one containing a Multiscale Dragonite, which additionally does not know Roost either. But in spite of that realization, I never actually got around to trying to fixing those flaws in the team... until I discovered PokeBattle. When I first entered this simulator early on during its closed beta stage, I was at a lost of where to begin, as I had no team suitable for the PBV tier. As such, I imported the OU team I was most comfortable with over - Arsenal's team, only to find that the team's total PBV exceeded the PBV limit for a team by 90 points. Witnessing such, I knew that I had to make changes to the team, and my first solution was to replace one or two existing members of the team with Pokémon that are less costly in terms of PBV, yet can serve the same roles, even if not necessarily to the same degree of effectiveness as in the original team. Having used a Klefki with the moves Foul Play, Substitute, Swagger and Thunder Wave extremely extensively in XY Ubers using one of my signature teams in that metagame, In Luck We Trust, I was completely aware of how incredibly devastating that Klefki moveset can be. As it provided incredible support for the team in the form of Prankster Thunder Wave just like Thundurus-I, my first solution to the problem I was faced with was to look up Klefki's PBV. I did so, and found that the Key Ring Pokémon was worth 165 PBV, 30 less than Thundurus-I during the closed beta stage of PokeBattle, so, being desperate to decrease my team's PBV, I decided to replace Thundurus-I with Klefki. 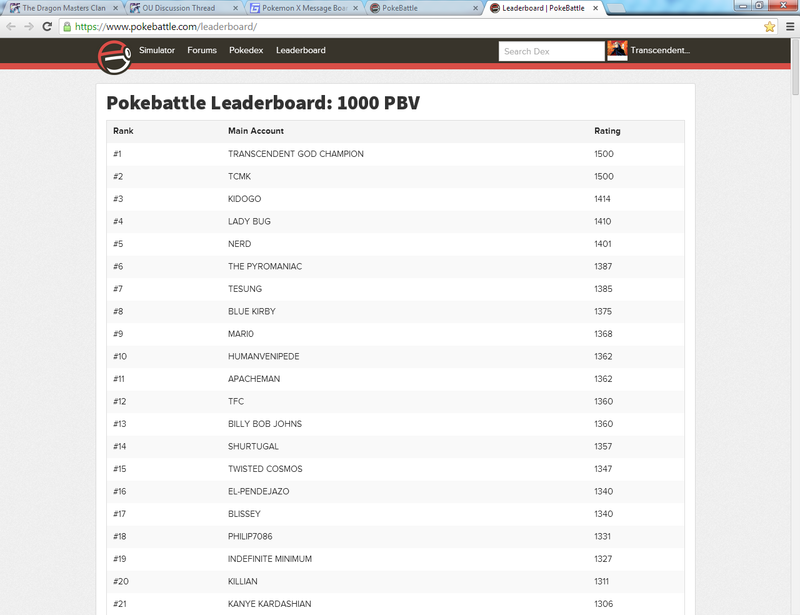 Having knocked off 30 PBV, I needed to decrease my team's PBV by at least 60 more points in order to have a team capable of being used on PokeBattle's ladder. At this point, I remembered the two weaknesses that plagued Arsenal's team in the OU metagame, and therefore looked for a way to solve them. The first solution that came to my mind was a physically-defensive Blastoise, due to its ability to check Mamoswine while at the same time utilizing Rapid Spin. But what followed that thought was the decision of which existing Pokémon to replace. Analyzing Arsenal's team, the reason why it was so weak to Mamoswine was because every single member with the exception of Conkeldurr was incredibly weak to its attacks, with four of such members being weak to its priority move of all attacks - its Ice Shard. And although I replaced Thundurus-I with Klefki, that hardly helped at all, as the Key Ring Pokémon was weak to Earthquake. With the aforementioned in mind, replacing Conkeldurr was obviously out of the question, so I looked at what the other five members contributed to the team. With Klefki's ability to support the team incredibly well by stopping fast offensive threats with Prankster Thunder Wave, Aegislash's absolutely wonderful contribution to the team's defensive synergy, Mega Garchomp's use of the mandatory Stealth Rock, Dragonite's access to a very powerful priority attack which is incredibly useful for revenge-killing purposes, as well as an aspect of favoritism in the case of the last two Pokémon since Mega Garchomp and Dragonite are my second favorite Mega Evolution ever next to Mega Charizard X as well as my absolute favorite Pokémon ever since Generation I respectively, I initially thought that Landorus-I was the Pokémon that contributed the least to the team, being just a one-dimensional specially-offensive threat, as ridiculously strong as it may be. Combining this with the Abundance Pokémon's incredibly high PBV relative to the rest of my team, valued at 195 during closed beta, I made the decision to replace it with Blastoise, and thus built my very first PokeBattle team, at 985 PBV. After laddering for a bit with this team, I noticed that it was very weak to Fairy-type Pokémon, both offensively and defensively. In response, I thought back to how Arsenal's OU team handled such Pokémon, and remembered Landorus-I's Sludge Wave. Seeing that the Ground/Flying-type Pokémon was not weak to Fairy-type moves either unlike Mega Garchomp, and could learn Stealth Rock itself, I decided to replace Mega Garchomp with the Landorus-I that Arsenal had before, except I put Stealth Rock and Hidden Power [Ice] over Focus Blast and Psychic, since I have always disliked the Focus Blast's frustrating accuracy and found Hidden Power [Ice]'s ability to destroy many annoying Ground/Flying-type Pokémon such as Landorus-T and Poison Heal Gliscor to be more valuable than Psychic's ability to hit Conkeldurr and Mega Venusaur a bit harder than Earth Power does. With Landorus-I replacing Garchomp, the team had a PBV total of exactly 1000 during the closed beta stage of PokeBattle, although this number dropped back to 985 after the PBVs of Aegislash and Landorus-I were decreased in this simulator's open beta stage. In addition to the aforementioned changes, I also put Iron Head over Sacred Sword on Aegislash to help against Fairy-type Pokémon, especially considering the fact that Landorus-I does not exactly enjoy switching into Moonblasts or Sylveon's Hyper Voice, and Earthquake over Superpower on Dragonite to deal with opposing Aegislash better. Finally, I made Aegislash shiny just because I think this Pokémon's shiny form looks incredibly awesome. Having done all of that, there was only one thing missing for my team: a name. Probability-Defying Perfection was chosen for two reasons - the first being that, with the exception of Klefki's Swagger, which has 90% accuracy anyway, absolutely every move used in this team has 100% accuracy. This is a factor which has undoubtedly contributed immensely to my overall success with this team, because as high as a move's accuracy may be, as long as such is imperfect, it is pretty much bound to miss at least once after many, many battles, and missing an attack on a crucial turn often costs matches, something that is extremely debilitating on the higher end of the ladder, as it can often take ten victories just to make up for all the points lost from one defeat - and if one is using moves with imperfect accuracy, it isn't unlikely that one may miss a move on a crucial turn at least once within those ten battles, resulting in yet another loss and thus a downward spiral on the ladder. I have experienced the aforementioned unbelievably frustrating phenomenon many times before, especially back when I often relied on a 75% accuracy Will-O-Wisp for victory in many of my teams back on the Generation V DW Ubers ladder, and thus I cannot help but feel pride in consciously knowing that the current team I use will almost never result in me losing a match because of a crucial miss. Winning consistently over many, many battles is the key to success in Pokémon, as that is what it takes to reach the glorious #1 position on the ladder, and while the laws of probability dicate that teams that rely a lot on moves with high but imperfect accuracy will eventually, after many battles, miss with those moves, Probability-Defying Perfection, as its name suggests, defies such a law with the 100% accuracy of every barring Swagger, and thus rises above the imperfection of many other Pokémon teams in existence, embodied by the flawed accuracy of the moves they rely on as well as the fact that the ability for such moves to miss will eventually lead to their downfall. And the second reason why I chose this name for the team was because of the presence of one of its members, Klefki, whose moveset strongly evokes the concepts of luck and probability. And when I do happen to fight a battle in which I get exceedingly lucky with the opponent's Pokémon hurting itself in confusion and/or being fully paralyzed, not that I particularly depend on such luck, I get the feeling that I am the luckiest man on Earth - a man whose fortune is completely unbound by the laws of probability. On the rare ocassions in which I happen to turn a battle which I would otherwise lose completely around thanks to getting lucky by firing a Swagger against a Pokémon and having it hurt itself in confusion when that Pokémon would otherwise KO Klefki in one hit, the concept described by the name of this team is also once again evoked. As far as the name of this team is concerned, my only regret is my inability to find a name that expresses all of the aforementioned aspects of this team while simultaneously drawing attention to the very interesting fact that four of this team's members have access to priority in some form, and of the two members that do not have access to such, one of them is the only Pokémon in the team that can be said to possess a high Speed stat, and that Pokémon just so happens to be immune to both Thunder Wave and Sticky Web (and if you think about it, not a single member of this team is significantly hindered, if affected by Sticky Web at all either), making this team extremely resilient to strategies that aim to deprive the opposing team's members of their Speed. Though I would hardly be so unreasonable as to claim that I invented this Klefki moveset, more commonly known as SwagKey, I nonetheless consider it to be my signature Pokémon in Generation VI - the face of my identity as a Generation VI Pokémon trainer, for numerous reasons. Firstly, I have used SwagKey extremely extensively throughout Generation VI so far, in three seperate tiers - PokeBattle's PBV tier, XY Ubers, and XY OU. And the second reason is because SwagKey and my use of this Klefki movesets reflects a lot of my core values and beliefs as a Pokémon trainer - while many people dislike the SwagPlay strategy due to the way it allegedly "takes no skill to use" and undermines the competitiveness of Pokémon battling by turning it into a game of coinflips, I cannot help but embrace the idea that Pokémon battling is a fundamentally uncompetitive, luck-based and gambling game (not that it is any less fun in my eyes), due to the fact that even if Swagger is not used in a battle, and the phenomenon people refer to as "hax" does not occur in a battle, such battle's outcome is oftentimes still nonetheless heavily affected by many other forms of luck that are inextricable from the game anyway, such as team matchups, scenarios involving 50/50 predictions, guessing what moveset or Mega Charizard form the opponent's Pokémon which could viably run multiple different movesets is using (even if such guesses can be educated, they are ultimately still guesses and can be incorrect no matter how educated they are), and situations involving Pokémon running an unexpected move to lure out and KO a specific Pokémon. Finally, using SwagKey is not exactly an easy experience, considering how incredibly frowned upon the use of this strategy, and by extension the person using it, is, and as such, my ability to continuously and defiantly use this strategy in spite of the aforementioned serves as a symbol and indication of my strength, willpower and resolve as a person, something I have valued to a great degree even back in 2004-2007, when I continuously used a similarly luck-based and frowned-upon strategy in Generation II - one-hit KO moves. Even the nickname of my Klefki reflects such, as it was named after the Luckpwner, a one-hit KO abusing Mew which is also the best Pokémon in Generation II as well as one of my proudest creations ever among Pokémon movesets. Of course, I do think that skill exists in the game of Pokémon, but such skill takes the form of probability management, just like in many other games such as poker and mahjong. In determining the outcome of a battle, I believe that skill merely takes a secondary role, with luck being primary, and skill is something within a Pokémon trainer that can never even come close to being determined through success within one or three battles, but only with consistent success over an absolutely insane number of matches, as luck evens out over many, many battles. So in case what I have explained above may seem contradictory to what I have mentioned earlier about the downfall of depending on things that may fail due to misfortune, I am using SwagKey not because I wish to depend specifically on getting lucky with Swagger and/or Thunder Wave to win, but rather, to use a Pokémon with what I personally believe to be the single best defensive typing in the game, combined with the ability to serve as an emergency stop to fast sweepers with Prankster Thunder Wave (which is especially useful for this team as none of its members with the exception of Landorus-I is known for their Speed), and this Klefki's ability to destroy teams or turn losing battles around with SwagPlay and Swagger respectively is only secondary. In truth, I do not even think that SwagKey is as luck-dependent to use as many people think, at least relative to the use of anything else in the game of Pokémon, since optimizing the effectiveness of this Pokémon does not simply involve blindly firing a Swagger against anything in front of Klefki in hope to get lucky, but rather, involves looking for a free turn to set up a Substitute before initiating the SwagPlay cycle, as well as a huge amount of consideration of risk VS. reward. "How threatening is the opponent's Pokémon at +2 Attack to Klefki and my team in general? Do they have physical priority moves that could make Swagger backfire even if the opponent's Pokémon gets paralyzed?" "Do I need to conserve my Klefki, due to the observation of fast offensive threats such as Mega Kangaskhan, Greninja and/or Charizard remaining in my opponent's team, which may need to be checked by Klefki's Prankster Thunder Wave later on in the match?" The above are just a few of the questions one must ask themselves before clicking "Swagger" with Klefki. This Klefki's utility in Probability-Defying Perfection is almost endless and differs a lot depending on the battle - sometimes, it looks for a free turn to set up a Substitute, most commonly against a Pokémon which has no way of breaking it in one hit, such as Mandibuzz, Mega Venusaur or Darkrai, before proceeding to wreak havoc upon the opponent's team with SwagPlay. Sometimes, it depends on luck with Swagger. Sometimes, it doesn't even utilize Swagger, Foul Play or Substitute at all, but simply sacrifices itself while paralyzing a fast offensive threat on the opposing team so one of its teammates can outrun and finish it off. Sometimes, it uses Swagger and/or Thunder Wave not to directly beat a Pokémon with SwagPlay, since certain Pokémon such as Clefable, Florges, Chansey, Blissey, Sylveon and Poison Heal Gliscor are almost impossible to overcome with SwagPlay (and thus it should also be pointed out that one should be very aware of SwagKey's limitations when one sees one of the aforementioned Pokémon in Team Preview), but rather to lower their chance of actually attacking, so that one can buy a possible free turn to easily switch from Klefki to a Pokémon that threatens the opponent's confused and/or paralyzed Pokémon. And other times, especially against stall teams, since Klefki tends to contribute little if anything against them, it is used as nothing more than death or sleep fodder. There is no clear-cut way to use Klefki, since the way it should be used depends highly on the situation and what is seen of the opponent's team in the Team Preview. However, unless one intends to fodder Klefki, a general rule of thumb is to never let it get deprived of its Leftovers or especially let it get burned, as such events would severely hinder its effectiveness and longevity. *The EVs and Nature serve to maximize Klefki's special bulk, as not only are the vast majority of Pokémon it tends to switch into directly and tries to set up against specially-offensive from my experience, but regardless of its physical bulk, it isn't going to be taking Earthquakes or Swagger-enhanced physical attacks well anyway. The 32 EVs placed in Speed are for the purpose of Speed-creeping opposing SwagKey, since being able to Swagger or Thunder Wave them or set up a Substitute first is of game-changing importance in a battle between two SwagKey. Assault Vest Conkeldurr is simply an amazing Pokémon, especially for its relatively low PBV. While it may be slow, it possesses a great defensive type with incredible natural physical bulk and artificial special bulk thanks to its Assault Vest, and combining such with the ability to restore HP despite its item thanks to Drain Punch, it is an amazing general tank. And its sky-high Attack combined with its excellent coverage between its moves as well as its access to priority and the Ability to benefit from status (most notably burn, which would normally hinders physical attackers) makes it an awesome offensive Pokémon too. With the aforementioned qualities, this Conkeldurr is an extremely valuable member of Probability-Defying Perfection, which can tank its way through and beat many Pokémon including Rotom-W, Rotom-H, Mandibuzz, Quagsire, Gastrodon, Mega Manectric, Kyurem-W, Kyurem-B, Zapdos, Genesect, Heatran, and even outright counter or use Mach Punch to revenge-kill certain Pokémon such as Bisharp, Tyranitar, Mega Tyranitar, Mega Gyarados, Darkrai and Mega Kangaskhan. Drain Punch is its strongest move which it can use to heal itself, Ice Punch destroys Gliscor, both Formes of Landorus, Salamence, Dragonite and Garchomp, while Knock Off is a great move not only for heavily damaging the Ghost and Psychic-type Pokémon that are immune to or resist Conkeldurr's Fighting-type moves, but depriving the opponent's Pokémon of its item is also great, especially in the case of knocking off the Leftovers of a Fairy-type Pokémon such as Sylveon,Clefable or Florges as they switch into Conkeldurr, making them significantly easier to defeat - Sylveon in particular actually has a chance of being, with some luck, defeated by Kefki's SwagPlay after it is deprived of its Leftovers. As this team has no Choice Scarf holder, it relies heavily on priority to stop fast offensive threats, and Conkeldurr contributes to that with its fast and powerful Mach Punch attack. *While maximizing the power of all of Conkeldurr's attacks, the EVs serve to optimize the Muscular Pokémon's defenses on both sides, in order to enable it to serve as a mixed tank. This Conkeldurr was given the nickname "The Master" as its appearance reminds me of an aged martial arts master. Just like Conkeldurr, this Pokémon is yet another slow but incredibly sturdy tank that has access to priority, as well as the ability to hit incredibly hard, especially with its devastating Spooky Plate-boosted Shadow Ball, which destroys many Pokémon in two hits and perhaps even weakening them down to Shadow Sneak KO range, and many teams do not have a Pokémon to switch into this extremely destructive attack. It can often switch into a weak neutral or resisted attack very easily, before proceeding to blast a hole through the opponent's team with its dreaded Shadow Ball, and repeat this process many times throughout a match thanks to its supreme bulk while in Shield form. Although Iron Head does not have perfect coverage with Shadow Ball, I have nonetheless opted for this move over Sacred Sword for the ability to destroy Clefable, Sylveon and Florges, as these Pokémon do not mind taking Shadow Ball, especially if they use Calm Mind or Cosmic Power, and the only other Pokémon in the team capable of hitting these three Fairy-type Pokémon hard is Landorus-I, which cannot keep on switching into Moonblasts or Hyper Voices. Though it obviously does not hit Tyranitar as hard as Sacred Sword does, Iron Head is also great for denting the Armor Pokémon heavily on the switch. Finally, for a Pokémon as reliant on its ability to tank attacks as Aegislash, the Royal Sword Pokémon's signature move, King's Shield is only self-explanatory on this set, not only for increasing its defenses, but also for scouting as well as for lowering the Attack of the opponent's Pokémon, which can be helpful for softening the attacks Aegislash may take from that Pokémon later. This Aegislash was given its nickname after a technique from the Soul Edge/Soul Blade/Soul Calibur series, which Aegislash's signature move strongly reminds me of. In Generation II, I often used Blastoise in competitive battles for the purpose of checking Rhydon, utilizing Haze to check Swords Dance Mew and other set-up sweepers, clearing Spikes with Rapid Spin, and as an added bonus, gambling for free KOs with Fissure, a move the Shellfish Pokémon could learn at the time. In one of my greatest Generation II teams, Universal Mastery, I utilized a Blastoise that was, inspired by the ease with which it defeated many incredibly tough Pokémon with Fissure, given the nickname "Crushtoise". Little did I imagine that ten years and four generations of Pokémon later, I would be using that very same Pokémon once more for pretty much the exact same purpose, except its 30% chance of taking out a Pokémon in a single hit has merely been reduced to a 30% chance of burning a target with Scald. In Probability-Defying Perfection, Blastoise, as a Rapid Spinner, beats many common Stealth Rock setters such as Heatran, Excadrill, Donphan, Hippowdon, Mamoswine, Landorus-T, Garchomp and Tyranitar. With Haze, it can check some threatening sweepers such as Dragonite, Mega Charizard X, Gyarados, Mega Gyarados, Belly Drum Azumarill and Quiver Dance Volcarona, while also being able to completely and utterly stop Baton Pass teams dead in their track. It also, in general, can switch into many physically-offensive threats that are weak to its attacks, such as Talonflame and Garchomp to stop them a few times throughout a match. The Speed EVs allow it to outrun max. Speed Adamant Azumarill, so it can negate Azumarill's Belly Drum boosts with Haze before Azumarill can attack. Scald's burn chance is also very nice, and helps a lot against Mega Scizor, Gyarados, Mega Gyarados and Azumarill (they get beaten by Blastoise one-on-one most of the time if they get burned). To maximize the team's effectiveness against stall, a specially-offensive Life Orb-holding Sheer Force Landorus-I was chosen, for its ability to hit insanely hard in general with Earth Power while also being able to easily dispose of Fairy-type Pokémon with Sludge Wave, since this team otherwise has trouble disposing of numerous very bulky Fairy-type Pokémon. Hidden Power [Ice] is a useful tool for destroying Pokémon that possess a 4x weakness to this move, especially Gliscor and Landorus-T, which resist this Landorus-I's other two attacks, and Stealth Rock is put on this moveset as Landorus-I is literally the only Pokémon in this team that learns the move. Although it may be far from the most reliable Stealth Rock setter due to its frailty, it can still oftentimes set up this entry hazard with little drawback if played correctly - for example, after switching into the Earthquake of an opposing Gliscor or Landorus-T aimed at this team's Klefki, Landorus-I can find a free turn to set up Stealth Rock as the opponent switches out their own Ground/Flying-type Pokémon in fear of Hidden Power [Ice]. The Abundance Pokémon's incredibly powerful special attacks are very helpful for breaking down extremely bulky Pokémon such as Mega Venusaur, and with its trollish 101 base Speed, it can outrun many offensive threats including the likes of Mega Kangaskhan, Kyurem-W and the two Mega Charizard forms, and often KO them before they even move. Although the following may be risky, Landorus-I's immunity to electricity can also allow it to serve as a pivot by switching into an Electric-type move from a fast Electric-type Pokémon (or one that is immune to Earth Power and can defeat Landorus-I easily) such as Jolteon, Mega Manectric, Raikou, Zapdos or Rotom-W directed at Blastoise, before immediately switching out to Aegislash as the opponent's Pokémon uses Hidden Power [Ice] (or Hydro Pump in Rotom-W's case), in order to not only prevent Aegislash from being damaged by a neutral, Same Type Attack Bonus Electric-type move as opposed to a weak and not very effective attack, but also preventing the opponent from simply damaging Aegislash with Volt Switch while immediately regaining momentum by sending out a Pokémon that threatens Aegislash. From that point onward, one can then proceed to blast a hole through the opponent's team with one of Aegislash's devastating attacks, most likely its Spooky Plate-enhanced Shadow Ball. As it possesses the Ability Sheer Force while utilizing Earth Power as its primary attack, the first thought that came to my mind as I thought about what to nickname this Pokémon was "Terra Force", one of the signature moves of WarGreymon from the Digimon series. The last and strongest member of Probability-Defying Perfection, DRAGONITE for the win! SwagKey may be my signature Pokémon in Generation VI, but the original dragon of the original generation will always hold a position far higher than that of the Key Ring Pokémon as far as I'm concerned. From its Hyper Beam-centered all-out offensive movesets which I used back in my newbie days in Generations I and II, to the myriad of Haze and/or Horn Drill-utilizing Dragonite movesets I later used in Generation II on Pokémon NetBattle, to its Huge Power sets that served as the basis of my team during my time as the POKéMON LEAGUE CHAMPION in Generation IV thanks to database modifications of my server, to the mixed sets I abused extremely extensively in Generations IV and V, the Hurricane-abusing rain offensive sets I used in early DW OU, and finally, this hulkingly powerful Choice Band set, Dragonite has been my signature Pokémon across all generations ever since Generation I, having served me in countless different ways in a myriad of different teams across those generations. Inspired by the sheer, destructive power of just one of the innumerable Dragonite movesets I have used long ago, the Dragonite in this team was, once again, given the name Kazeryuu. With its incredibly powerful Choice Band-boosted Extreme Speed, Dragonite is able to heavily damage many fast and frail offensive threats such as Greninja, Mega Houndoom, Mega Manectric, Mega Absol, Darkrai, Shaymin-S, Keldeo, Darmanitan, Salamence, Talonflame, Landorus-I and both Formes of Thundurus, being able to easily KO them from about 50% health or higher, making it an awesome lategame sweeper against offensive teams once the opponent's Pokémon that are immune to Extreme Speed or are capable of taking it well are removed. Aside from lategame sweeping, Dragonite's Extreme Speed also serves the incredibly useful role of being able to check fast sweepers by revenge-killing them, notably from a significant amount of remaining health, too. 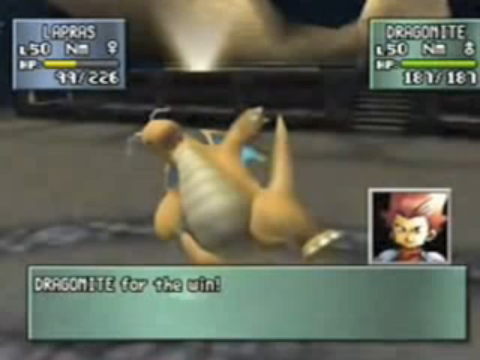 Even if Dragonite fails to KO a fast sweeper with Extreme Speed, it can knock them down to a low enough health such that Aegislash's Shadow Sneak and/or Conkeldurr's Mach Punch can finish the job anyway (or alternatively, one of those two Pokémon can fire the first attack, leaving Dragonite's Extreme Speed to deal the finishing blow). In this way, the Dragonite in Probability-Defying Perfection can be said to serve a similar role to Choice Band Talonflame and Choice Scarf Genesect in this generation, as well as various Pokémon such as Choice Scarf Terrakion, Choice Scarf Garchomp and Choice Scarf Flygon in the metagames of previous generations - that being to revenge-kill fast threats or sweep lategame while being locked into a single move. A recurring theme in such Pokémon is that while they perform excellently against offensive teams, they tend to be of little help against stall, as being locked into a single move that isn't particularly powerful, due to Talonflame's average Attack stat as well as the fact that Choice Scarf does not boost the power of any of the other Pokémon's attacks results in them being easily walled by stall teams, despite the fact that they are offensive Pokémon. However, what is just said about them cannot be said about Choice Band Dragonite. Between Earthquake, Fire Punch, and its nuclear Outrage attack, this Dragonite possesses incredible coverage, being capable of smashing irreparable holes into many teams, given proper prediction, making it an excellent wall-breaker as well as a highly dangerous weapon against stall teams. Earthquake, after the Choice Band boost, heavily damages the bulky Fairy-type Pokémon such as Clefable, Sylveon and Florges, and this move along with Fire Punch allow Dragonite to destroy the innumerable Steel-type Pokémon that impede Dragonite's Extreme Speed and Outrage attacks - Earthquake smashes Aegislash without running the risk of having Dragonite's Attack lowered by King's Shield, in addition to burying Heatran alive, while Fire Punch heavily damages Skarmory while also being able to instantly incinerate the likes of Ferrothorn, Scizor and Mega Scizor. And Outrage, of course, simply smashes any Pokémon that do not resist it - even the likes of Mega Venusaur, Eviolite Dusclops and Suicune fall to two hits from this devastating move. With Multiscale, which is easily maintained thanks to Blastoise's Rapid Spin, Dragonite is, in the words of Lance of the Elite Four, "virtually indestructible", being capable of surviving just about any unboosted attack, which comes in handy in numerous situations, such as for surviving the Ice or Dragon-type attack of a Pokémon with high enough health to survive Dragonite's Extreme Speed when the Dragon Pokémon is lategame sweeping with this move, as well as for allowing the Dragon/Flying-type Pokémon to tank a +2 Sucker Punch from Bisharp or Mega Mawile if it is needed to come into such Pokémon in order to take them out with Earthquake. While Extreme Speed is Dragonite's most-used attack against offensive teams, one should definitely never forget the value of its other three attacks against them, especially when predicting a switch or facing a slower Pokémon. Furthermore, Dragonite's Earthquake, Fire Punch and Outrage attacks can be unbelievably devastating against offensive teams in the event that a significant portion of such a team happens to get paralyzed by Klefki. It should also be mentioned that it is Dragonite's presence in this team which is what significantly increases its resistance against Talonflame and Blaziken, Mega or not, being able to easily beat both of the aforementioned Pokémon one-on-one, snipe them down with Extreme Speed once they are sufficiently weakened, or even take advantage of their presence to hit a switch-in hard, such as a Skarmory with Fire Punch or a Heatran with Earthquake. Note that the above nicknames do not work on PokeBattle, but I decided to give my Pokémon such nicknames anyway for aesthetic purposes. : Although Probability-Defying Perfection has no perfect counter to the Mega form of this kangaroo, it can still quite comfortably play around it thanks to Aegislash's immunity to its Normal-type moves combined with Landorus-I's and Dragonite's immunity to Earthquake, Klefki's ability to paralyze this Pokémon and thus allowing the slow but bulky and powerful members of this team, especially Conkeldurr to outrun and beat it, Conkeldurr's ability to heavily damage Mega Kangaskhan with Drain Punch or revenge-kill it with Mach Punch once it is weakened, Landorus-I's ability to troll the Mega form of the Parent Pokémon with its 101 base Speed and deal immense damage to it with Earth Power, as well as Dragonite's ability to revenge-kill it with Extreme Speed once it is weakened. Furthermore, while playing around and overcoming Mega Kangaskhan is certainly not the easiest of tasks for Probability-Defying Perfection, a user of this team can rest assured that after it is defeated, the rest of the opponent's team should not be difficult to overcome, thanks to the unparalleled amount of PBV points Mega Kangaskhan takes up. : Despite the Blaze Pokémon's astronomical PBV, especially in its Mega form, defeating it is a piece of cake for Probability-Defying Perfection. Blaziken, Mega or not, cannot set up on a single Pokémon in this team barring Dragonite locked into Fire Punch, as with the exception of Klefki, which possesses Blaziken's biggest nightmare, that being Prankster Thunder Wave anyway, every single member of this team can damage the Fire/Fighting-type Pokémon to the point where it can be easily finished off by one of this team's three priority attacks. Furthermore, the fact that Landorus-I outuns a Mega Blaziken that has not acquired any Speed Boosts (and not all Mega Blaziken know Protect), as well as the fact that Dragonite just flat-out beats even a +2 Mega Blaziken one-on-one does the blazing chicken no favor. Furthermore, because the use of Blaziken, especially its Mega form takes up such a large amount of PBV, a team that includes this Pokémon in it will very often find itself at a massive disadvantage against Probability-Defying Perfection, as not only does Blaziken's presence in such a team put a huge limit on the effectiveness of the other five members, but the opponent's incredibly costly Fire/Fighting-type Pokémon is barely even a threat to this team anyway. : With the exception of Landorus-I, every member of this team can deal serious damage to this Pokémon, in its Mega form or otherwise, with all variants of Gengar holding any item besides Gengarite being KO'd in a single hit by Conkeldurr's Knock Off. With that said, if Gengar happens to come into a Pokémon which must be preserved for use later on in the match, the ideal Pokémon to switch out to is generally Klefki, which can tank its Shadow Ball well thanks to its EVs, while being able to cripple the Ghost/Poison-type Pokémon with Swagger and/or Thunder Wave, before looking for a free turn to set up a Substitute while Gengar is confused and/or paralyzed, and then knocking it out with Foul Play while beginning a deadly SwagPlay cycle against the opponent starting from the next Pokémon they send out. It is generally a good idea for Klefki to paralyze Gengar before assaulting it with Foul Play, due to the threat of Destiny Bond. Because the only Pokémon in this team other than Klefki which can attack a non-paralyzed Gengar before it moves is Aegislash with its Shadow Sneak, switching to Klefki as soon as one sees a Gengar is also a great way to play in order to avoid being forced to sacrifice a Pokémon to Gengar's Destiny Bond. And finally, once Gengar has been paralyzed, it can be easily outun and KO'd by most members of this team, and once a non-paralyzed Gengar has been sufficiently damaged, most commonly by Stealth Rock and/or the Shadow Pokémon's own Life Orb recoil, it can be revenge-killed by Aegislash's Shadow Sneak. : When one sees a Darkrai in Team Preview, the best Pokémon to lead with is Klefki, as Darkrai have a tendency to be leads. As Darkrai generally lack a way to break Klefki's Substitute in one hit with any move barring the highly inaccurate Focus Blast, and also have a tendency to use Dark Void first-turn against Klefki, the Key Ring Pokémon can easily set up a Substitute in Darkrai's face, before proceeding to begin the SwagPlay cycle, which should be devastating for the opponent's team since Darkrai generally find themselves in extremely offensive teams, which lack Pokémon such as Clefable and Chansey which can easily counter SwagPlay. However, if Darkrai does get the chance to put a Pokémon to sleep, one just needs to sleep fodder whichever Pokémon is judged to be the least useful against the opponent's remaining team, which shouldn't be too much of a loss most of the time, because by following my advice to lead with Klefki whenever one sees Darkrai in Team Preview, the Pitch-Black Pokémon has no way whatsoever of putting a member of Probability-Defying Perfection to sleep on the first turn, and with smart plays, some holes should be punched in the opponent's team by the time Darkrai gets the chance to put something to sleep, making it easy to make the decision of which Pokémon to sacrifice (perhaps not even indefinitely) before Darkrai's Dark Void. After Darkrai has put something to sleep, Klefki can easily switch into it to paralyze it or turn it into setup fodder, while Conkeldurr and Dragonite also help a lot against this Pokémon with their powerful priority attacks. : With Aegislash and Klefki possessing a resistance to both of the Gratitude Pokémon's Same Type Attack Bonus moves, while being able to survive Earth Power as well as either heavily damage it with Shadow Ball before finishing it off with Shadow Sneak, or paralyze it with Prankster Thunder Wave, Shaymin-S is hardly a threat to this team. Dragonite's Extreme Speed does the Grass/Flying-type Pokémon no favor either, and it is also worth mentioning that once Shaymin-S gets paralyzed, it can be easily disposed of by Conkeldurr's Ice Punch, Blastoise's Ice Beam, and Landorus-I's Sludge Wave or Hidden Power [Ice]. : In its Mega form, Lucario is a threatening Pokémon to this team. It is generally beaten by having it paralyzed by Klefki so that it becomes easily outrun and beaten by this team's other members. Otherwise, Conkeldurr can beat it one-on-one but cannot switch in, Aegislash needs to play a mindgame with it via King's Shield if Mega Lucario Swords Dances as Aegislash switches in, and Dragonite can also beat it. Oftentimes though, Mega Lucario as a threat is sidestepped simply because they have a tendency to set up a Swords Dance or Nasty Plot against this team's Aegislash in its Blade form after it has KO'd another Pokémon, expecting a King's Shield, only to take a Shadow Ball to the face on that turn, at which point, after Aegislash uses its signature move on the next turn to protect itself from being hit by a possible Bullet Punch while in Blade form (assuming Lucario had used Swords Dance and not Nasty Plot), it can then safely finish off the Aura Pokémon with Shadow Sneak. Aegislash's Shadow Sneak in general can also be used to finish off weakened Mega Lucario, and Conkeldurr can also revenge-kill this Pokémon with Mach Punch from a high health, though one should be prepared to take a +2 Bullet Punch, Extreme Speed or Vacuum Wave in that case. : Assault Vest Conkeldurr can survive any move from the blazing frozen dragon besides a Choice Specs Draco Meteor, and heavily damage it in return with Drain Punch before finishing it off with Mach Punch. As such, any non-Choice Specs Kyurem-W is no threat to the Muscular Pokémon, while Kyurem-W that do hold Choice items, especially Choice Scarf, find themselves in an akward situation against this team, considering Klefki is immune to Dragon-type moves while Aegislash resists them, Klefki and Aegislash both resist Ice Beam, Blastoise and Dragonite resist Fusion Flare, and Landorus-I and Dragonite are immune to Earth Power. In particular, Klefki coming into a Kyurem-W locked into any move besides Fusion Flare and Earth Power spells instant devastation to the opponent's team as it then gets its free Substitute and can thus begin the SwagPlay cycle. The three priority attacks of this team, especially Conkeldurr's Mach Punch can finish off a weakened Kyurem-W, especially with the help of Stealth Rock damage. Landorus-I can outrun any non-Choice Scarf Kyurem-W and heavily damage or finish it with Earth Power if it is weakened, and the Boundary Pokémon, especially its Choice Scarf set just becomes much easier to deal with if it gets paralyzed by Klefki, enabling it to be easily outrun and hammered by Aegislash's Iron Head, Conkeldurr's Drain Punch and Dragonite's Outrage. : When a user of Probability-Defying Perfection first sees a Charizard coming into their Aegislash, Conkeldurr or Landorus-I, the first Pokémon to switch to is always Blastoise in order to tank a potential Fire-type attack. Then, regardless of which Mega form Charizard Mega Evolves into, one should switch immediately to Klefki next, while Mega Charizard Y fires its not-very-effective Solar Beam, or Mega Charizard X either Dragon Dances or launches a completely ineffective Dragon-type attack. At this point, against Mega Charizard Y, one should start spamming Substitute with Klefki, hoping for a turn in which Fire Blast misses, at which point one can then begin the SwagPlay cycle. If the opponent's Mega Charizard Y uses Flamethrower, or does not miss with Fire Blast before Klefki becomes too weak to make a Substitute, the Key Ring Pokémon should simply paralyze the opponent's Flame Pokémon before foddering itself. In addition to fishing for a potential turn in which Fire Blast misses so that Klefki freely gets behind a Substitute, spamming this move against Mega Charizard Y also serves two other purposes, the first being to scout for a switch to a Pokémon immune to Thunder Wave, since many people would be hesitant to let their Mega Charizard Y get paralyzed, and the second being to stall out the harsh sunlight, so that if Klefki ends up having to paralyze Mega Charizard Y before sacrificing itself, Blastoise can easily come in afterward and beat it. If the opponent's Charizard Mega Evolves into Mega Charizard X, then one should still scout for a few turns with Substitute before firing the Thunder Wave, especially if the opponent has a Pokémon immune to Thunder Wave in their team. It should also be mentioned that for Probability-Defying Perfection, Mega Charizard X is significantly easier to deal with than Mega Charizard Y, as Conkeldurr and Blastoise can both hold their own decently against it one-on-one, while Landorus-I can outrun and KO it with a single Earth Power provided it has not acquired any boosts with Dragon Dance. Both Mega Charizard X and Mega Charizard Y can also be revenge-killed by Dragonite's Extreme Speed once weakened, or outrun and destroyed by Dragonite's Outrage once they are paralyzed by Klefki. : Klefki can paralyze it or even set up a free Substitute against it if it is locked into an Ice Beam aimed at Landorus-I or Dragonite, Conkeldurr and Aegislash can take any hit and retaliate hard with Drain Punch and Shadow Ball respectively, Aegislash and Blastoise can both switch into its Ice Beams, Landorus-I can outrun any Genesect without Choice Scarf and KO them instantly with Earth Power, and the team's three priority attacks also do the Paleozoic Pokémon no favor. : Countered by Conkeldurr. Blastoise can also deal with it, Aegislash can hit Tyranitar that are expecting a Shadow Ball hard on the switch with Iron Head, and Landorus-I and Dragonite heavily damage it with their Ground-type moves, though do note that due to Tyranitar's Sand Stream, Dragonite will forfeit its Multiscale if it does that. The aforementioned apply to both Tyranitar and Mega Tyranitar. : Admittedly, this is an extremely threatening Pokémon to Probability-Defying Perfection. Pinsir love to come into Conkeldurr, at which point one should switch in Klefki as the opponent Mega Evolves and uses either Swords Dance or an Aerilate-enhanced attack, before paralyzing Stag Beetle Pokémon and then sacrificing Klefki. At this point, one can opt to, depending on the opponent's remaining team, either heavily damage Mega Pinsir with Aegislash's Shadow Ball before sacrificing it and then sending in Dragonite to revenge-kill with Extreme Speed, or have Dragonite's Multiscale broken while knocking out the Bug/Flying-type Pokémon with two Extreme Speeds or an Outrage. Although, due to Mega Pinsir's chance of being fully paralyzed, be relieved to know that one is not guaranteed to need to make one of the aforementioned sacrifices. If one is lucky enough to have Mega Pinsir fully paralyzed on the turn when Klefki casts its Thunder Wave, one can even beat Mega Pinsir with SwagPlay, or alternatively, if Conkeldurr has served its purpose by the time Pinsir shows up before it, one can choose to predict and Ice Punch the Stag Beetle Pokémon hard on the turn it Mega Evolves and Swords Dances, so that after Conkeldurr or another death fodder falls to Mega Pinsir, Dragonite can come in to revenge-kill it. : All of its sets are easily handled by Conkeldurr. As Kyurem-B rarely hold Choice Scarf, Landorus-I can easily revenge-kill it with Earth Power once it is weakened as well. Stealth Rock and Klefki's priority Thunder Wave also make life very hard for this Forme of the Boundary Pokémon, allowing it to be outrun and struck hard with Iron Head, Drain Punch, and Outrage, just like this Pokémon's White Forme. : In its Mega form, it is another incredibly threatening Pokémon to this team. It must be played around through a combination of gradually weakening it on the switch with Conkeldurr's Drain Punch, switching Aegislash into a predicted Play Rough before firing its Shadow Ball, stalling it with Blastoise's Haze while hoping for Scald burns, revenge-killing it with a full-health Dragonite's Earthquake, and if desperate, trying to overcome it through sheer luck with SwagPlay. : Only really a problem if it comes into Dragonite locked into the wrong move or Blastoise, and even against the latter it risks getting burned by Scald, and Landorus-I or Dragonite can switch into a predicted King's Shield and threaten it immensely with their Ground-type moves. Landorus-I can even set up Stealth Rock against Aegislash on a predicted King's Shield. Conkeldurr has Knock Off, which can heavily damage the Royal Sword Pokémon even after having its Attack cut in half by King's Shield, as since Conkeldurr is slower than Aegislash, it can attack the Steel/Ghost-type Pokémon in its Blade form with a -2 Knock Off. At the same time, Conkeldurr can hold its own very effectively against Aegislash thanks to its Assault Vest. Also, there is a very cheap and effective trick involving Klefki with which one can easily dispose of Aegislash, and that involves simply using Substitute with Klefki to block an attack from Aegislash while exposing its Blade form, before outrunning and knocking it out on the very next turn with Foul Play, assuming the opponent does not use King's Shield, of course, although they would be hesitant to do so in fear of letting Klefki set up a free Substitute, in which case it can then begin the SwagPlay cycle. Aegislash with Substitute can be troublesome however, though they are not common and can still be played around with the Ground-type moves of Landorus-I and Dragonite. : Landorus-T are often Stealth Rock leads, so if one using Probability-Defying Perfection leads with Landorus-I, they get to freely set up Stealth Rock as the opponent switches out in fear of Hidden Power [Ice]. Blastoise completely counters Landorus-T while being able to Rapid Spin away the Stealth Rock it sets up, Conkeldurr beats the Abundance Pokémon with Ice Punch, and Aegislash often damages the Ground/Flying-type Pokémon badly on the switch with Shadow Ball. Landorus-T also enjoys switching into Klefki in anticipation of Thunder Wave, enabling it to be hit on the switch with Swagger, or have Klefki set up a Substitute as it switches in before using Swagger, and then defeating the Abundance Pokémon or at least heavily damaging it with just a bit of luck. : Conkeldurr and Aegislash can tank its attacks well and beat it easily, threatening to hit another member on the opponent's team hard should Thundurus-I opt to switch out against one of them. Dragonite also deals massive damage to this Pokémon with Extreme Speed. : Extremely destructive offensively against Probability-Defying Perfection, so the best way to handle it is to just KO it as quickly as possible with Conkeldurr or Blastoise (even if it means getting them badly damaged in the process), lure it in with the threat of Klefki's Thunder Wave before SwagPlaying it to death, or utilizing Dragonite's Extreme Speed. : Aegislash and Klefki can easily switch into Deoxys-S and just destroy it, and Blastoise easily removes any hazards it sets up. Dragonite's Extreme Speed can be useful against this Pokémon too. : Blastoise tanks even Choice Band Talonflame's Brave Bird reasonably well while being able to retaliate with Scald, and Talonflame locking itself into Brave Bird just gives Aegislash and to a lesser extent, Klefki momentum. Dragonite can also beat Talonflame one-on-one, or even revenge-kill it is if it is weakened, within an Extreme Speed whose priority transcends even that of Talonflame's Brave Bird. : As Klefki and Aegislash resist both of Latios's Same Type Attack Bonus moves, the Dragon/Psychic-type Pokémon won't be getting very far against Probability-Defying Perfection without prediction. Even then, Latios experiences a lot of trouble against this team as it cannot safely switch into Conkeldurr since it risks getting KO'd by a single Knock Off on the switch, and Aegislash's Shadow Ball and Shadow Sneak, combined with Klefki's Thunder Wave, Swagger and Foul Play as well as Dragonite's Extreme Speed will make life very hard for it. : Once it is paralyzed and confused by Klefki, Dragonite easily outruns and smashes it with its nuclear Outrage, while Landorus-I can outrun it regardless of paralysis and heavily damage the Tail Glow variants of this Pokémon with Earth Power. Aegislash's Shadow Ball also helps against paralyzed and weakened Manaphy, and Haze Blastoise can hold off Calm Mind Manaphy somewhat while fishing for Scald burns. : Can be dealt with in pretty much the same ways as this Pokémon's other two Formes. : In its Mega form, this is an extremely annoying defensive Pokémon. Generally, Mega Venusaur has no way to break Klefki's Substitute in one hit, making it setup bait for the SwagPlayer, though unfortunately, not only does Klefki have to watch out for both Leech Seed and Sleep Powder on the switch, but setting up a free Substitute against Mega Venusaur with Klefki often doesn't mean much, since Mega Venusaur often finds itself in defensive teams, which will, more often than not, contain Chansey, Blissey or a bulky Fairy-type Pokémon to stop Klefki from sweeping with SwagPlay anyway. This team mainly beats Mega Venusaur by putting a huge amount of pressure against it with a combination of Stealth Rock, Landorus-I's Earth Power and Dragonite's Outrage, and burning the Grass/Poison-type Pokémon on the switch with Blastoise's Scald goes a long way in helping to break through it. : Because Heatran are often leads, leading with Landorus-I against it is a good idea. If Heatran isn't holding an Air Balloon, it will switch out, allowing Landorus-I to set up Stealth Rock on turn 1. Blastoise can also take Heatran's attacks well while being able to retaliate with a super effective Scald or Rapid Spin away the Stealth Rock it sets up. Conkeldurr also easily destroys the Lava Dome Pokémon with Drain Punch. : Whether or not the Embrace Pokémon may be holding a Gardevoirite, Aegislash can switch into it relatively safely while hitting it or a switch-in hard with Iron Head or Shadow Ball. Landorus-I cannot switch in, but barely outruns Mega Gardevoir and makes quick work of it with Sludge Wave, and Gardevoir generally cannot damage this team's specially-defensive Klefki too badly, allowing Klefki to abuse it badly with Swagger, Thunder Wave, Foul Play, or a combination. Needless to say, Aegislash's Shadow Sneak and Dragonite's Extreme Speed can revenge-kill this Pokémon once it is weakened. : Pretty much the same thing as Latios. : Unless it carries Flamethrower, it more often than not cannot touch Aegislash, which pummels it repeatedly with Iron Heads or uses Shadow Ball in anticipation of a switch. Conkeldurr's Drain Punch and Dragonite's Outrage also make quick work of Blissey, and Conkeldurr at times even appreciates switching into a Toxic in order to power up its attacks with Guts. : Whether or not Scizor may be holding a Scizorite, Blastoise tanks its attacks very well, outruns it while being able to Haze away any Swords Dance boosts it acquires before it attacks (unless it strikes with a not-very-effective Bullet Punch, of course), and can fish for a Scald burn. Aegislash takes pitiful damage from any attack barring Knock Off, while being able to lower Scizor's Attack with King's Shield, and retaliate with devastating Shadow Balls, though it will need to play mindgames with King's Shield if the opponent happens to have a Mega Scizor with Roost. Landorus-I can take even a Choice Band Bullet Punch and hit back for huge damage with Earth Power, especially if the opponent's Scizor is not Mega Evolved, and Dragonite, even without Multiscale active, tanks any unboosted hit from Scizor easily and incinerates the Pincer Pokémon with a single Fire Punch. : Klefki and Aegislash can switch into this Pokémon relatively safely most of the time and harrass it or its teammates with their respective abilities. Dragonite can revenge-kill a weakened Tornadus-T with Extreme Speed, and once the Cyclone Pokémon has been paralyzed by Klefki, it can be very easily dealt with by this team's numerous slow but powerful Pokémon.